Cimaron has crossed the big island of Japan and became an extra-tropical cyclone. NASA's Aqua satellite looked at Cimaron in infrared light and saw cloud tops were warming as the elongated storm weakened. 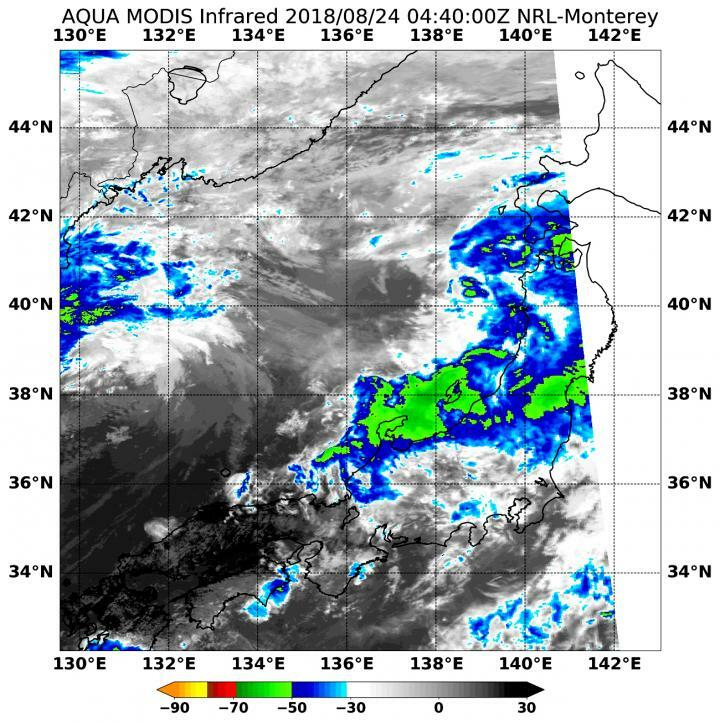 On Aug. 24 at 12:40 a.m. EDT (4:40 UTC) the MODIS instrument or Moderate Resolution Imaging Spectroradiometer aboard Aqua saw cloud tops dropped in the atmosphere and warmed, indicating the uplift of air in the storm was weakening. Infrared data provided cloud top temperatures. The coldest clouds were the strongest storms. NASA's Aqua satellite found two areas where cloud top temperatures were coldest and as cold as minus 50 degrees Fahrenheit (minus 45.5 degrees Celsius). One larger area was located in west central Japan and moving into the Sea of Japan. The second smaller area was located over east central Japan. On Aug. 24 at 5 a.m. EDT (0900 UTC) the Joint Typhoon Warning Center issued the final bulletin on Extratropical Storm Cimaron. The storm had crossed central Japan and was emerging into the Sea of Japan. It was centered near 40.8 degrees north latitude and 137.7 degrees east longitude, about 161 miles west of Misawa, Japan. Cimaron was moving to the north-northeast and had maximum sustained winds near 45 knots (52 mph/83 kph).